1. This morning I had a job interview at another school. Some would say it's a better school, I would say that it's just more affluent. Anyways, but time I got home from school there was a message on my voicemail offering me the job. So now I know that I will be employed next year, yay! 2. 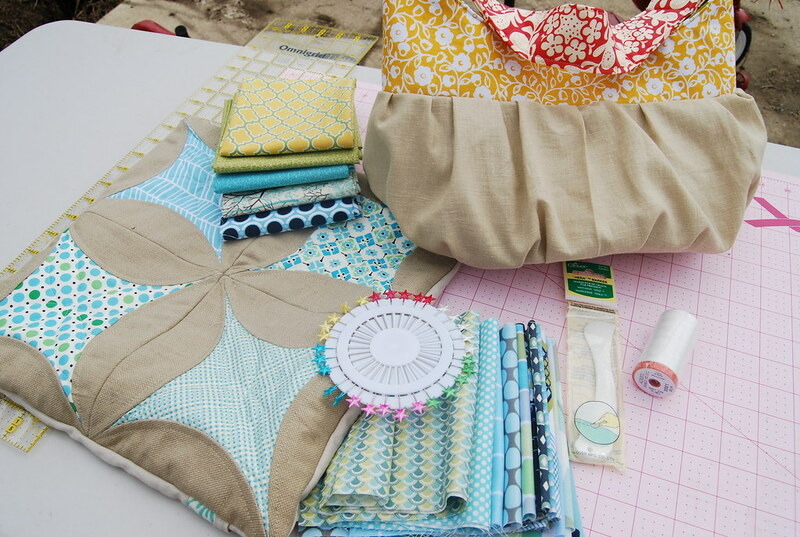 I received my Make Mine Modern swap goodies from Tracey. I'm not going to say much here because they deserve their own post. With lots of pictures. But here is the picture she took, just to give you an idea of how lucky I am. 3. I found out that a quilt that I made is not only being published (I have known that since January), but is also going to MARKET!! Can you believe it?? A quilt that I made is going to be displayed at Market!! The quilt will be in the June/July issue of Quilter's Home. 4. I redecorated my blog! There are still a few things I want to spruce up, but overall I'm happy with how it's looking. It was too cluttered and there wasn't a theme. So the theme is now par-tay! I think it reflect my aesthetic a bit better - clean and simple with some fun and colors! 5. See down at the bottom where it lists my followers? Notice that number? Over 100!! That is a HUGE FREAKIN' DEAL! And the number keeps going up! I can hardly believe it. So, for sticking with me (through this post and the ones before it) I have a little give away. :) I picked up a few of my favorite craft books to share with you guys. To win, leave a comment telling me something that we have in common. Anything? Nothing? Which book would you prefer? Giveaway is open to everyone until April 27. Thanks for the giveaway and I enjoy reading your blog! Beautiful new changes to the blog, Ali! Just keep posting and your follower count will continue to rise. What do we have in common? You're an awesome quilter, smart, and talented woman. I'm so happy to say that I am too! I'd love the Dare to be Square book, especially because my 4 year old saw the cover and declared "ROBOTS!" He's already sold! One suggestion for the blog - videos! Your tutorials are so clear and perfect, I know it's not really necessary, but I'd love to "see" you in person, ya know? Love the new heading Ali. oh, i really like the changes to the blog - congrats! and speaking of congrats: hey, soo cool ~ your quilt at quilt market is definitely a reason to party! a thing we have in common: fabric hoarding...not in common: you're far better than me in letting fabrics go :). Wow! What an awesome week you've had! :) From a job offer to quilt feature--love it. 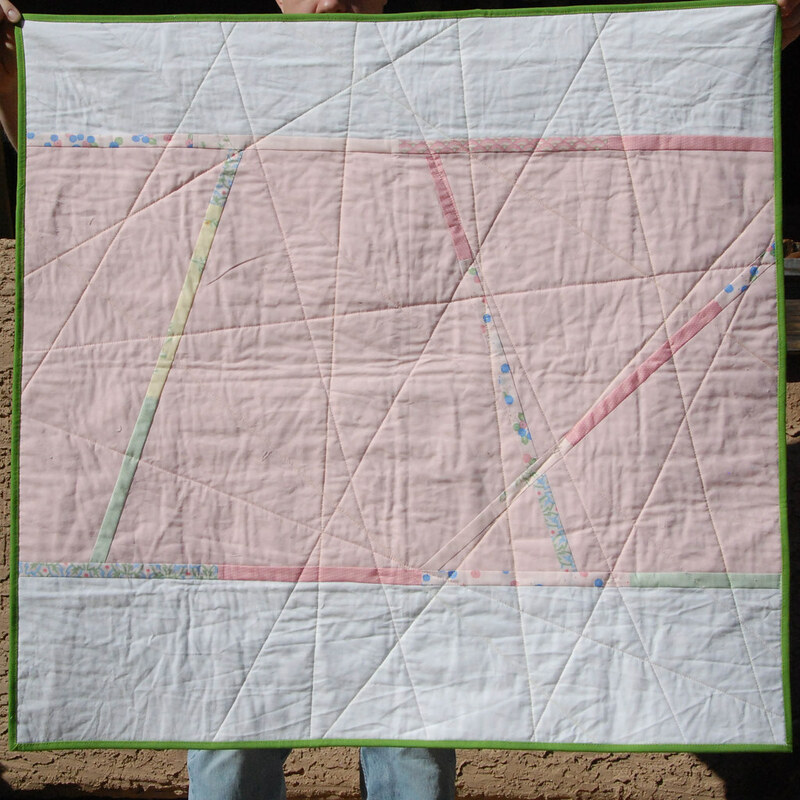 I'm the math lover who bought the DS quilts bundle from your Etsy shop. I am always excited when I find another woman who loves math. Sometime I'll have to share my "Sophie [Germain] is my Homegirl" shirt with you. We both love buntings! Love the new look of your blog!! And those are some fantastic books you are giving away! I have been wanting the Dare to be Square book for a long time now! Will you still talk to me when you're famous with your own fabric line and a book published and so much more?! Will you remember me? hee hee - I'm so proud of you! I think we share a liking for a lot of the same fabrics. You are a way more adventurous quilter than I am though! Congrats on 100 followers! That is A HUGE deal! Yay! Well, maybe we both like math? And then there's the obvious - I love craft books and fabric. As the parent of a child who had great middle school math teachers, I think you have one of the most important jobs around. And I like what you've done with your blog. 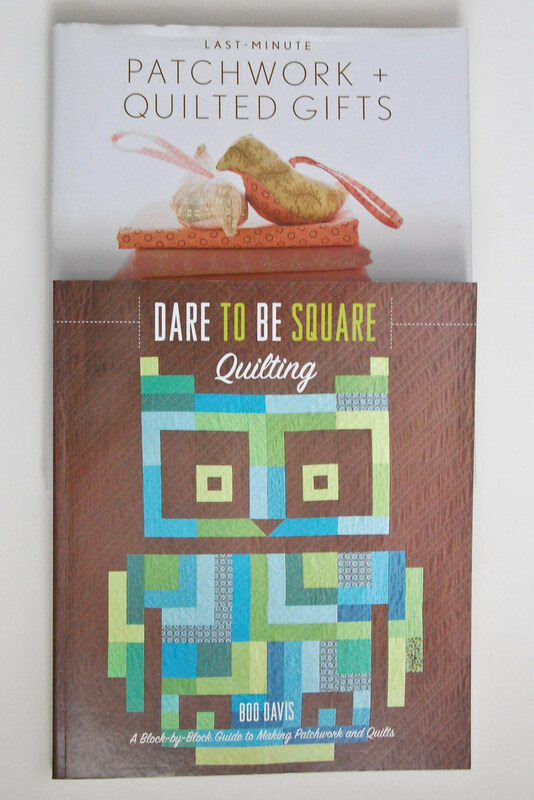 Lastly, since I already have the Patchwork and Quilted Gifts, I would LOVE to have a copy of the Dare to be Square! We are both fabric addicts who love a good pattern with plenty of pics, and we both always have a stash of Burts Bees Lip Balm handy! I would love the Dare to be Square. I am new to quilting, and this book is just perfect for me. We are both females! There something in common. Congrats on the job and the blog makeover. Oh my gosh!!!! What a great day for you!! I had a good day today, too...we've been looking for houses for months, and today we found 2 to put offers on (obviously we're only buying 1, though, lol). We have our heart set on one...hopefully it works out! I'm so glad about your job, and that's AMAZING that your quilt is going to market!! I have had that Dare to be Square book on my Amazon wishlist for awhile! In common..we are in one of the same swaps/bee on Flickr. Congratulations on being offered the job, I'm really so happy for you! Getting a message when you get home should make you feel really good, obviously they were very impressed with you. I'd love the Patchwork book, I actually have Dare to Be Square and it's fabulous! Fabric addicts unite! I like your blog. I'm glad I found you! Glad to see your follower numbers getting higher!!! :) I think I would rather have the patchwork book. Congrats again! And Happy Easter! I also get excited about fabric, finished quilts, and fun mail! Congrats on your new job! I also work in a school. Things in common - we love to sew, we both like old wooden spools of thread and we both hoard fabric! Congrats on 100 followers! Just found your blog today, so I have no idea what we have in common. I came in via the bookshelf block (I'm a librarian). Any more sneak peaks of this quilt. I have a rocking books pattern I'm itching to use. I have one bookshelf pattern- but your's looks promising. Thanks for the chance. Thanks for the "just because" giveaway. Things we have in common: the traits that most quilters share - love of making quilts and the "stuff" that goes with that.... and I taught high school for 3+ years. Book: Dare to be Square. I like using zig-zag stitches too as that is the only other "decorative" stitch that my sewing machine will do:) The owl is so cute on the cover of the "Dare to be Square" book! Your blog is great, I'll definitely be keeping an eye on it :) I sew, you sew! We're both fabric addicts and we wear glasses. And we both like giveaways! We are both definately fabric hoarders!! I love the new look of your blog: simple and very cheerful: well done! What we have in common: love of fabric? quilting? we both Love to sew and I would love either book. Your blog looks all freshened up for spring (but I liked it before, too). You like color, I like color. I like the look of the Patchwork and Quilted Gifts book. And congrats on your work being published and going to Market!